Kuala Lumpur, 5 December 2018 – Most artists would not think of polluted streams as an ingredient for art production, but Ohio University’s Art Professor John Sabraw did just that. His current artwork has broken new grounds in the field of fine arts by creating paint and paintings from chemical compounds specifically extracted in the process of remediating polluted streams in Ohio, United States of America (US). 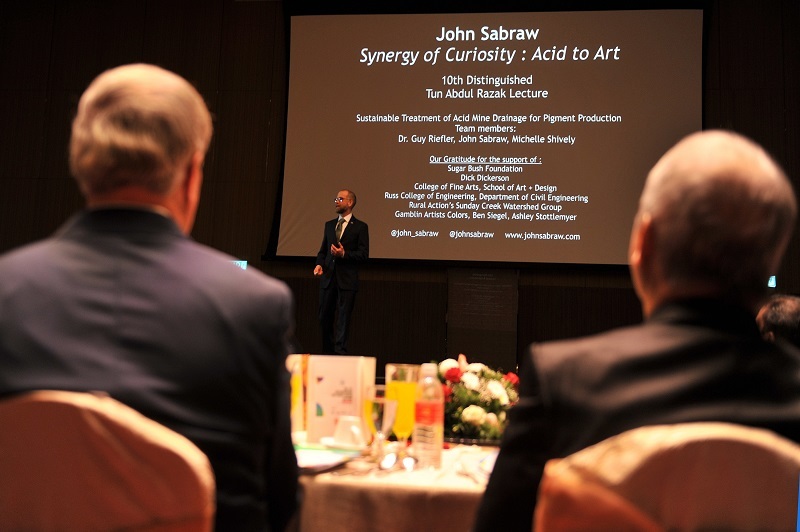 Professor Sabraw delved into these efforts during the 10th Distinguished Tun Abdul Razak Lecture titled “Synergy of Curiosity: From Acid to Art,” held on 3 December 2018 at the Sime Darby Convention Centre (SDCC) under the auspices of the Tun Abdul Razak Chair. The lecture was hosted by the Ministry of Education Malaysia (MoE), Universiti Teknologi MARA (UiTM), Universiti Putra Malaysia (UPM) and Yayasan Sime Darby (YSD). Also present at the event was Tun Abdul Razak Chair Founder YABhg. Tun Musa Hitam. Established in 1979 and named in honour of the second Prime Minister of Malaysia, the Tun Abdul Razak Chair Programme at Ohio University aims to introduce and raise awareness on Malaysian history, culture, economic, social and political life in the US as well as provide a platform for knowledge exchange on global issues in Malaysia. The Chair aims to strengthen the understanding and appreciation for Malaysia among selected constituencies and to better serve the goal of building stronger ties between the US and Malaysia. The Chair is also the first of such position to be established at any American university, which is unique in addition to Ohio University’s Centre for International Studies – South East Asian Studies. YSD Acting Chairman Tan Sri Dato’ Seri Dr Wan Mohd Zahid Mohd Noordin stated that Professor Sabraw’s lecture exposes Malaysians to the novel approach of using the arts to highlight the importance of environmental sustainability for community health, which is a crucial aim of the Foundation under four of its five pillars. “The 10th Distinguished Tun Abdul Razak Lecture promotes the objectives under our Education, Environment, Community & Health and Arts & Culture,” he said. “By using the arts to highlight the ways in which our interconnected way of life is dependent on the environment and vice versa, Professor Sabraw is highlighting the delicate balance that ought to be struck between our consumption, growth and development with our environmental needs. “We hope that this lecture will not only open our eyes to the ways in which sustainability can be approached even through the unconventional medium of the arts, but to also highlight that through science and innovation, there are many ways to undo much of the damage that has been done and continues to be inflicted on our environment,” he added. Prior to delivering his presentation at the 10th Distinguished Tun Abdul Razak Lecture, Professor Sabraw conducted an art workshop with 40 young artistes and participants on 30 November 2018 to impart knowledge on his method of using pigments derived from toxic waste in his artwork. All these artworks were exhibited during the lecture at SDCC and open for sale to the public. Proceeds from the sale will be donated to the National Autism Society of Malaysia (NASOM), as part of the organiser’s social responsibility. MoE Director General Datin Dr Paduka Siti Hamisah Tapsir said of all the chairs that the Malaysian Government has established in foreign universities all over the world, the Tun Abdul Razak Chair at Ohio University has been the most successful. “In existence for almost 40 years, it has seen 15 Malaysian scholars as intellectual ambassadors advancing Malaysia-US understanding in higher education and related fields,” she said. “MoE seeks to strengthen the Malaysia-OHIO linkages through sustainable programmes and activities that enhance our presence at the global arena,” she added. Prof. Datin Paduka Dato’ Dr. Aini Ideris, FASc. the Vice Chancellor of Universiti Putra Malaysia said: "UPM is privileged that three of our faculty members have been given the opportunity to hold the Distinguished Tun Abdul Razak Chair at OU in previous years. Their involvements showed our strong commitment towards this important collaboration to benefit stakeholders from both universities and our two countries."